Since 2009, Space Horizons has looked at intriguing ideas capturing our attention in the space field and asking “if this is so cool, why isn’t it happening”. Chipsats, chipsat launch vehicles, clouds of satellites, totally safe cubesat propulsion, McMurdo Base on the moon – the International Lunar City – why don’t we have those things? Maybe they are considered too hard – ok, what’s the hard part? Is there a pathway to solve it? Maybe there’s no funding for it – why not? Maybe it isn’t commercially viable. Is there a way to lower cost or increase return, or a non-economic model? Working with a core of experts surrounded by professionals and students, we put the future under a microscope and for one day try to understand how to make it happen. February 16, 2017 we will look at a dream humans have dreamed probably since we have dreamed – flying to a star. Alpha Centauri, long a destination of science fiction and recently spotlighted for its earth-sized planet Proxima b, is again in focus since Stephen Hawking suggested traveling the 4 light year distance with a 1 gram satellite on a chip accelerated by photon propulsion, achieving 20% the speed of light to get to our nearest stellar neighbors in just 20 years. This year Space Horizons is co-organized with the Breakthrough Initiative, headed by Dr. S. Pete Worden, whose focus is to realize that mission. Pete will provide this year’s keynote address. 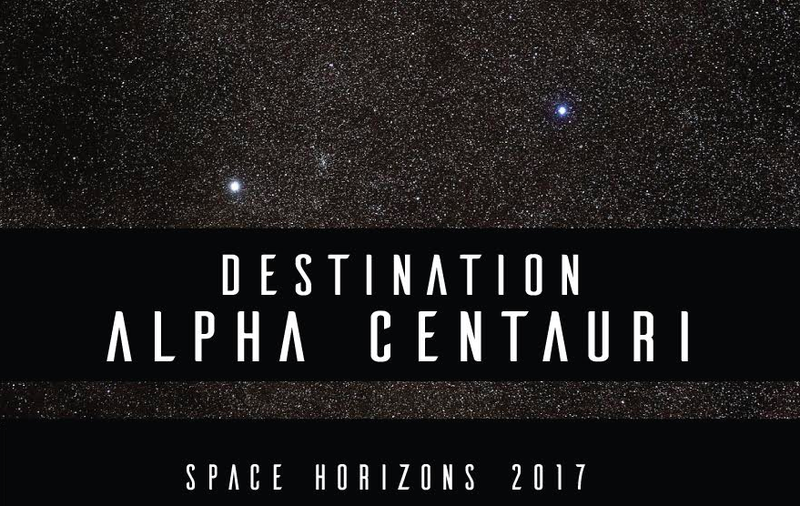 – Is Destination Alpha Centauri worth doing? What do we need to learn going to Alpha Centauri to make it worth the trip? What can be the impact on humanity of projecting our machines out to our closest neighboring solar system? – What ideas are out there for reaching that destination, 105 million times farther away than the moon reached by Apollo nearly 50 years ago? What is stopping us from starting the voyage Right Now! Technological impossibilities, financial, policy and social obstacles? Is NASA only going to fund it if otherwise China will get there first? What will we learn thinking our way to Alpha Centauri that will change how we do space closer to earth? Join us for this fantastic voyage compressed into 8 stimulating hours of investigation into the possibility of true interstellar travel at Brown University this February 16. Watch this space and your email inbox for details on registration, papers, round tables and posters. Save the Date and make sure you’re on our mailing list by clicking this link and supplying us your contact info. Our lists and your email remain solely with us – we do not sell, loan, copy or otherwise make available any of your data. Looking forward to seeing you here at Brown for Space Horizons 2017, the first step toward humanity’s longest leap ever!